The Occidental men’s basketball team tips off its season with eight more players than last year. In the 2016–17 season, the team had 13 players, but this season the team increased its roster to 21. The season began Nov. 4 with an exhibition game against Westmont College, which is a National Association of Intercollegiate Athletics (NAIA) Division I team. According to Michael Wells, associate head basketball coach, NAIA schools are one step up from Occidental and other Southern California Intercollegiate Athletic Conference (SCIAC) schools. 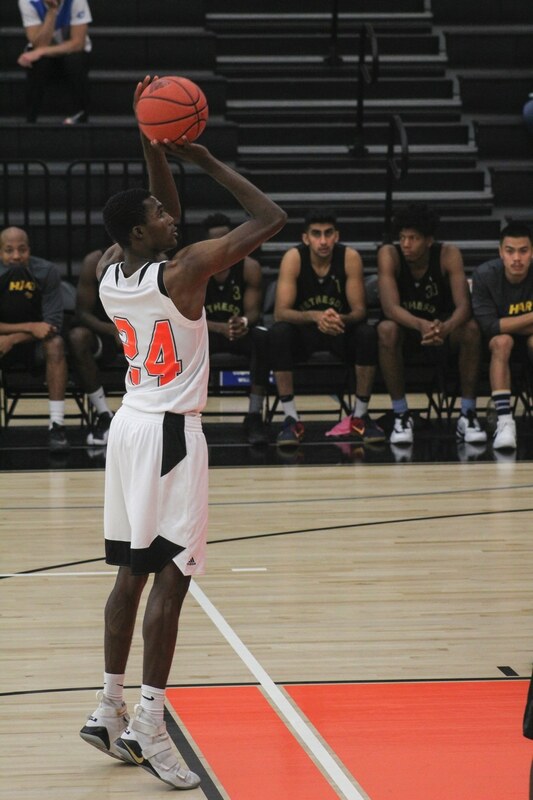 Occidental lost to Westmont 69–62, and will have their first regular season game against the California Institute of Technology at Occidental Nov. 15. Captain Austin DeWitz (junior) said the team would have liked a win, but the game still provided them a confidence boost, which was especially rewarding after the long preseason of practices. According to captain Zach Baines (junior), Occidental held their own against Westmont. “The fact that we made it such a close game shows the chemistry and the amount of gel this team has early on,” Baines said. The team has 11 first-year players and one senior, making the program relatively young. Baines said the number of first years is beneficial, as it gives the team more opportunities to grow as early as possible. According to DeWitz, the increased roster size made practice in the preseason very different. He said losing two top-scoring seniors from last year will allow different players, including first years, to step into larger roles on the team. Wells said he feels there are differences associated with the increased roster size that will benefit the team. Taso Warsa (first year) said he agreed with Wells. He said there have been many opportunities to play during scrimmages and the competitive atmosphere is fun. Warsa said that he does not expect to frequently play during games, but there are opportunities made for him and others who do not get as much game time. “We have development games, so there’s going to be six of those for the guys that don’t play,” Warsa said. According to Wells, the team focuses on defensive play. Wells said that the team is committed to expanding man-to-man defense, and that the players focus on offensive pressure to force the opposing team to play at an uncomfortable pace. Wells and the coaching staff do not expect players to conform to a certain tactic. Instead, Wells wants to concentrate on helping players learn what they do best. “We want to know what ingredients we have before we try to cook spaghetti,” Wells said. Baines said he is focused on the team doing well and has a goal to make the SCIAC playoffs. According to DeWitz, because of the differences in the team this year, he hopes and expects the team to make it to playoffs. “I think we’re gonna surprise everyone,” DeWitz said. According to captain Ryan Kaneshiro (sophomore), limiting mental mistakes by staying in the moment will benefit the team and lead to a successful year. Wells said he is always looking forward to the next practice and chance for the team to be together. He said he is focusing on slowly upgrading the team and fundamentals. According to Wells, he aims to train his hardest now so that he plays his best basketball in January or February, just before SCIAC playoffs. DeWitz said he is eager for winter break practices, when the team has a chance to bond. Warsa said he has appreciated the camaraderie the team has brought — both among the 11 first years and among the team as a whole. According to Baines, the increase in team size has given everybody a chance to help one another out. “Everyone really pushes each other throughout every activity, whether it’s practice or morning lifts,” Baines said. The team had a record of 14–11 in the 2016–17 season, and hopes to improve upon that this year. The men’s basketball schedule and results are updated on the Occidental Athletics website.